Animated series. When the riders discover that Viggo is using two captured dragons to build a dragon prison, they must help them escape. Browse content similar to Between a Rock and a Hard Place. Check below for episodes and series from the same categories and more! What are we landing for? They're pulling away! Hookfang, come on! No, there's too many. And they're sailing in tight formation. -I'll show you a tight formation. We'll never be able to approach that convoy without being spotted first. Hiccup! This no time to play dress-up! And how can you even think of wearing yellow after Snoggletog? That, my friend is a fashion faux pas. This one is lighter and stiffer. It's made of a thin sheet of Gronckle iron. without using any wing-flap. It's ingenious! We're going to glide in right under their sight line. Honestly, I would have stuck with the red. Yellow with Night Fury black? Really? Puh-lease! Dragon Riders! Defend the cargo at all costs! Argh! That's our signal, let's go! We'll be taking your cargo now. so we can help with the other ships. I hope we didn't startle them too much with all that commotion. Hiccup? Where are all the dragons? Tuff, you think we tied these ropes too tight? No. You can never be too tight. Hiccup, these ships don't have any dragons on them, just marble blocks. Why would they fight so hard to protect a bunch of rocks? Whatever it is, it's moving fast. Whaa! Dragon stampede! Take cover! No! We need to get in the air! Hiccup, where are we headed? Look, we're going to follow this stampede to its source. These dragons, they're fleeing for a reason. -We need to take a closer look. Ooo! Ah! Yeah! Ooo! Ah! Yeah! Yeah! Yeah! Oh! Ah! It's all good in the archipela-hood. Doesn't look like Barf and Belch are going anywhere for a while. Hiccup, these ships are just like the ones from the convoy. Do your worst. I've stared down the mouth of a Whispering Death. Oh, real tough guy, huh? Put your mace where your mouth is. You won't get anything out of us, you dragon-riding dogs! Ugh! I thought that guy would never shut up. Am I right? Tuff, he was just about to tell us everything! Ha-ha! Sorry. It's a reflex. if you can track down that other convoy. Find out where it's headed. -The rest of us will scout this island for more answers. But why would Viggo need all this marble? OK, Ruff, Tuff, you'll strike on the ground. Fishlegs, we'll hit from the air. Cover me while we take out those wrecking balls. and what Viggo has to do with it. Hiccup, look closer. Those aren't wrecking balls! Hiccup, they're using Quakens for their demolition work. I'm sure they're OK, bud. Those two have survived worse. when the hammer hits the ground. Trapping them, then fighting them, now working them against their will! This is monstrous! I know these dragons. but they have a softer side. I know. No dragon deserves to be treated like this. -Then how are we going to free them? to hit someone with a branch. Oh, he's fine. Thorstons are known for our extremely thick craniums. Yeah. Warriors used to wear the skulls of our ancestors as helmets. I would very much like to forget. So, what's the plan to free those dragons, boss man? to cause a distraction for Fishlegs and Meatlug to infiltrate. but moments between the three of us don't have to be weird, guys. I realise you're both into me and that's hard on our group dynamic. -Oh, no, he did not. But I think it can still work. We're all grown-ups. and I really don't want you guys to take this one too hard. We got to keep it professional. It's best for the team, you know. Looks like our missing convoy. Let's hang back and see if they lead us to Viggo's delivery point. Seriously, we can make this work, ladies. but it'll be easier to manoeuvre in that tight quarry. and find out what Viggo is up to. It's gas, then spark! Belch, get with the programme, man! OK, Fishlegs, we've got them distracted, now release the Quakens! Don't worry, Quakens, we are getting you out of here. OK, girl, do your thing! That's not really the response I was expecting. W-W-W-What's the matter? You're free! Great! Go left, Belch! Go left! Toothless, the twins will never be able to outrun those Quakens. We need to draw them away. I think we got their attention. Sorry, I guess it's good for tight turns, but not high altitudes. I know, I know. I'll work on it. Meatlug, they don't stand a chance against those angry Quakens. I understand those dragons better than anyone. I'm the only one that can stop this. Oh, he cannot be thinking of training them! Fishlegs, get out of there! Except Barf took a branch to the eye. Oh! You guys are a hot mess, but I can work with it. Fishlegs, what were you doing out there? You nearly got yourself pulverised! than to the kindness of somebody who wanted to help them. I had a cousin in Stockholm that that happened to once. Fishlegs, freeing these dragons isn't going to be easy. Especially if they don't want to be freed. Those Quakens have obviously been in captivity for a very long time. There has to be a way to get through to them somehow. that it may be too late to save them. Ah! We can't let this excavation continue. Viggo definitely needs this marble for something big. But we also can't risk harming the Quakens. Barf, your gas breath. Pop in a mint. Tuff, that's not Barf's breath. Come on, woman, hasn't he been through enough already? It's a fissure. And gas? -No. That tremor wasn't Quaken-related. were actually the island's instability. -the island in the first place. are causing this island to become unstable. -So, my breath is fine? -Eugh! Let's not get crazy. You've got dragon breath. No offence, Barf. and get those Quakens off this island after all. Hey, does this place look familiar? I think we just figured out why Viggo needs all that marble. Look at that thing! It's impenetrable! What do you say we make some renovations? For once, Snotlout, you didn't say something ridiculous and annoying. Aw! See? I knew we could make this work. It's the marble! It must be impervious to dragon fire! Then we need a different approach! Viggo's created the ultimate dragon-proof fortress. We need to tell Hiccup what we found before another convoy arrives. One more shipment and this stronghold will be complete. And no dragon will be able to get in or out of it. Shut down this quarry and leave while you can. Haven't you noticed the island's unstable? I knew you were reasonable. 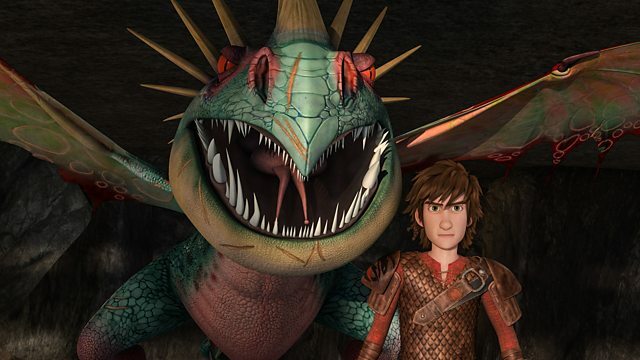 I don't think he's as reasonable as you think, Hiccup. OK, maybe the worst is over? I was wrong! Incorrect! Argh! OK, bud, we can do this. You won't hurt your friend. Maybe there IS a way to reach you! Fishlegs, we need to get out of here! Er...what happened to Barf and Belch? Why has the island sunk? And where did those two Quakens come from? I feel like we missed a lot. Hiccup, we know what Viggo wants the marble for. He's building a dragon-proof stronghold. A stronghold? We need to strike immediately. It won't do any good. Marble can withstand dragon fire. Um...Hiccup, I might have an idea of how we can take it down. But how many more dragons like these does he have out there? If they're out there, we'll find them and free them. Now, take us to Dark Deep. It's time for these Quakens to enjoy their retirement. I'd say they've earned it. Seriously, is someone going to tell me where those Quakens came from? This is becoming all too familiar, brother. But I promise, it ends now!